The unit “mole” is used in chemistry as a counting unit for measuring the amount of something. One mole of something has 6.02×1023 units of that thing. The magnitude of the number 6.02×1023 is challenging to imagine. The goal of this lesson is for students to understand just how many particles Avogadro's Number truly represents, or, how big is a mole. This lesson is meant for students currently enrolled in a first or second year chemistry course. This lesson is designed to be completed within one approximately 1 hour class; however, completion of optional activities 4 and 5 may require a longer class period or part of a second class period. This lesson requires only pencil and paper, as the activities suggested in this video place an emphasis on helping students develop their “back of the envelope” estimation skills. In fact, calculators and other measuring devices are explicitly discouraged. However, students may require additional supplies (poster board, colored pencils, markers, crayons, etc.) for the final optional/assessment activity, which involves creating a poster to demonstrate the size of a mole of their favorite macroscopic object. Jessica holds a B.S. in chemistry from MIT and a Ph.D. in molecular microbiology from the Tufts University School of Medicine. She has three years of teaching experience at the graduate level and one year at the high school level. 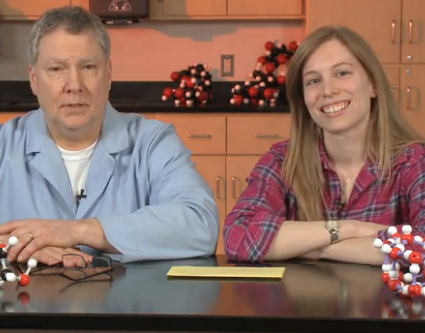 You can learn more about Jessica’s chemistry class through her website: http://meettheelements.wordpress.com/. Alan instructed chemistry for nearly 30 years at the university level, most recently at Boston University, before transitioning to teaching at Newton South. His thesis focus was on quantum chemistry—however, with a rich experimental background, he ran the numerous laboratory courses at Boston University. He has been involved in chemical education his entire career, specifically working with high school chemistry teachers since 1980. He maintains an active website for his current classes at: http://nshs-science.org. This famous film, “Powers of Ten”, takes viewers on a 9-minute adventure in magnitudes. This site, sponsored by LearnChemistry: Enhancing Learning and Teaching, provides a comprehensive list of resources for learning about moles.